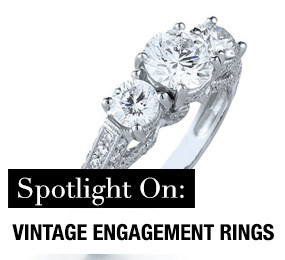 Popularized in 1919, the round cut remains the most popular engagement ring cut today. 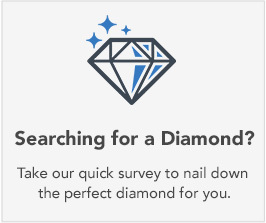 Due to both popularity and size loss during cutting, round-cut diamonds are also the most expensive among shapes of similar weight and quality. 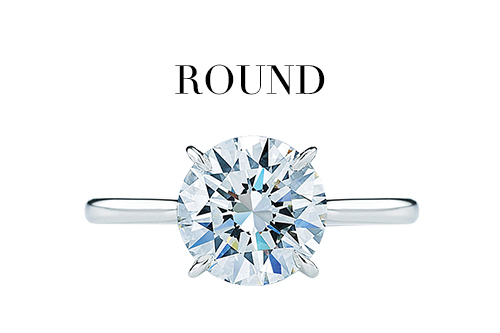 The round cut diamond can be paired with almost any type of setting. The solitaire and pave settings are popular choices to pair with the round cut diamond. 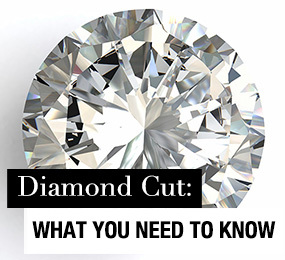 The round cut creates up to 58 facets without the light lost in square-type cuts. 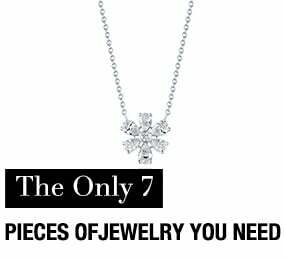 Round diamonds use a brilliant cut design, which maximizes the light reflection within the stone and gives it that classic brilliance and fire. The use of laser cutting techniques has enhanced the symmetry of contemporary round brilliant cuts, making this most light-catching cut even more spectacular. 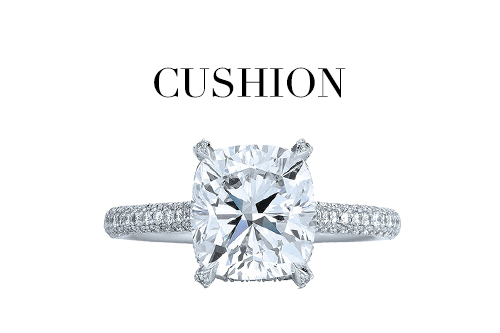 The cushion cut engagement ring is is a traditional shape that has been around for over 200 years. In fact, prior to the 20th century, the cushion cut was the most popular diamond cut available. 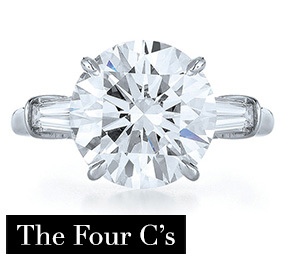 As the cushion cut regains popularity in the 21st century, many are drawn to its classic and timeless look. The cushion cut can be paired with gemstones of your choice for a unique and beautiful piece that expresses your brideâs individuality. 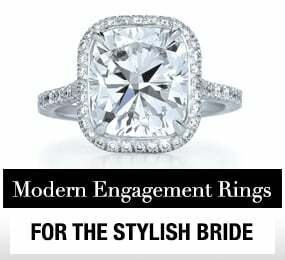 From the top, the cushion cut resembles a square with rounded corners, like a pillow or cushion, but a variety of patterns may be visible within the stone and still be classified as a cushion cut. 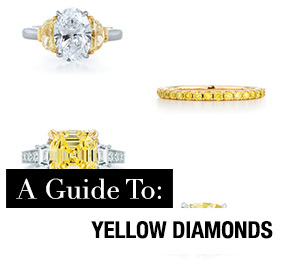 While less brilliant than some other cuts, cushion cut diamonds tend to be more fiery. 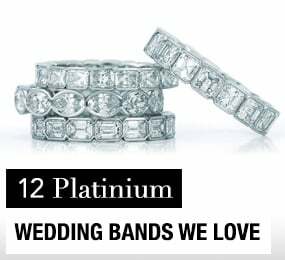 The emerald cut engagement ring is is an elegant style that is often associated with the emerald stone, but the emerald cut can actually be applied to any stone, including diamonds, rubies, and sapphires to name a few. 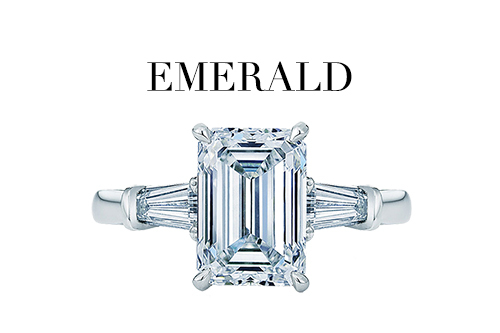 Like the Asscher cut, the emerald cut is a step cut rather than a radiant cut. This means the emphasis is on the clarity of the stone rather than on the brilliance and fire. From the top, the emerald cut looks like a square or a rectangle with the corners cut off. The emerald cut stone tends to have a slimming effect on the hands and fingers and is beautifully paired with matching side stones. The princess shape is the second-most popular cut for diamonds, although it can be used to enhance the sparkle of any square stone. 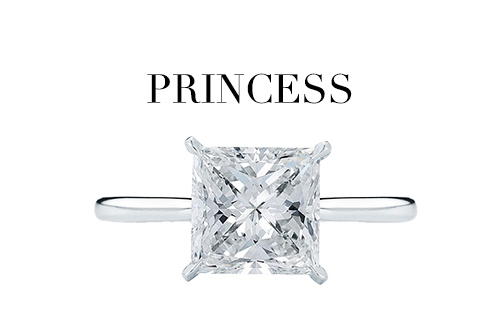 Developed in the mid-twentieth century, a princess cut gives a square stone exceptional fire and brilliance. In diamonds, the princess cut takes advantage of the stone's natural shape. This helps reduce size loss during the cutting process, maximizing the weight value of the finished stone. The weakness of the princess cut is at the corners, where the narrowly pointed tips are prone to chipping. 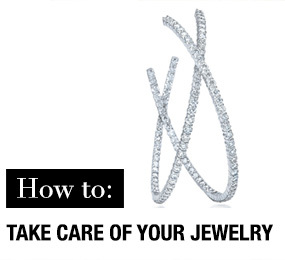 This is most frequently mediated by placing the prongs in the corners to both hold and protect the stone. A princess cut engagement ring is a richly-faceted square cut sometimes called a square modified brilliant cut. The dome-like crown lets light into the stone, while the chevron-shaped facets in the cone-like base, called the pavilion, reflect the light for that brilliant sparkle. The princess cut diamond is often paired with a pave setting, a three stone setting, or a solitaire setting. 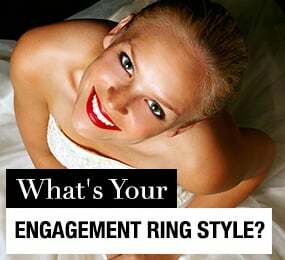 The oval shape engagement ring is gaining popularity. You can choose an antique look or a modern look depending upon your personal preference. 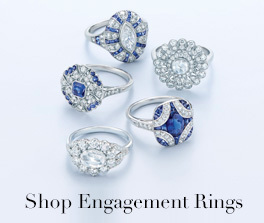 An oval shape engagement ring is often seen with flower motifs and pave accents. Brides-to-be love the oval shape engagement ring because it is a unique and beautiful symbol of your love. 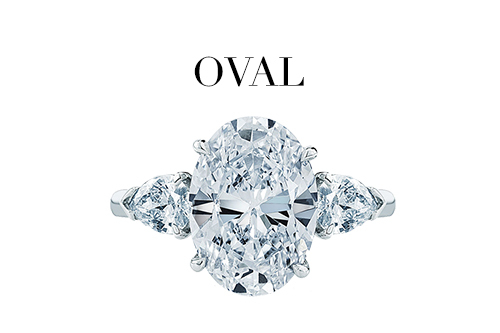 The oval shape engagement ring is a brilliant cut, like the round and marquise cuts. Its fire and brilliance are similar to the round cut, but its surface area is greater and it has fewer facets, giving it slightly less sparkle. 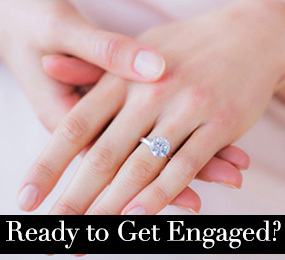 This is sometimes why the oval shape engagement ring is thought of as antique or vintage, but the oval diamond is actually a newer shape to hit the market. 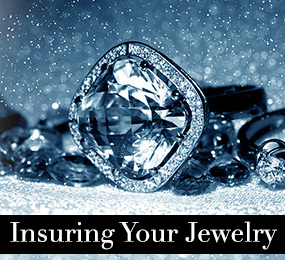 Oval shaped stones come in various sizes, some more elongated than others. An oval shape engagement ring is a classic style that can be paired with colorful gemstones or placed in a solitaire setting. Artisans and designers use different shapes with a variety of stones to produce stunning designs and fascinating combinations. Each stone has its own unique benefits. 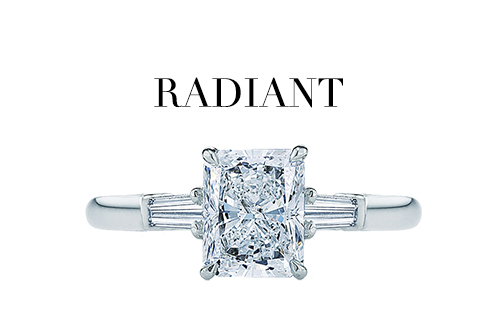 The shape of the stone in particular plays a huge role in the radiance and the sparkle of your engagement ring. A radiant cut engagement ring is a richly-faceted cut between a princess and a cushion cut that became popular in the 1980s. Rectangular or square, with blocked corners, it combines block cutting with the triangular faceting. Dramatic alone and lovely in combination with other cuts, this style complements round and square-shaped stones. Length to width ratio (how square or rectangular the stone is) is a consideration in radiant cut stones and may affect the setting. The radiant shape diamond is popular in a three stone engagement ring setting and is beautifully paired with the colorful gemstone of your choice. The Asscher cut has been around since 1902. After it peaked in popularity in the 1920s, this shape practically disappeared until it made a reappearance in the early 21st century. It has now begun to regain popularity. 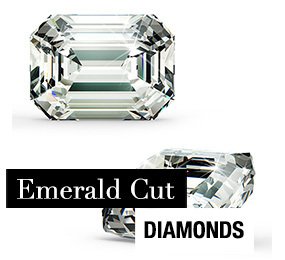 The emerald and Asscher cut are categorized as “step cuts. A step-cut stone is not as bright or fiery as a brilliant cut stone, but it emphasizes a stone's clarity, whiteness, and lustre. The shape and facets cut into the stone dictate the brilliance or reflectivity, fire or light dispersion, and artistic feel of the stone. Artisans and designers use different shapes with a variety of stones to produce stunning designs and fascinating combinations. From the top, an Asscher cut diamond looks like a square with the corners cut off. One striking aspect of the Asscher cut is that it features a series of concentric squares receding into the stone. The Asscher cut actually be divided into two categories - standard and royal. According to the Royal Asscher Company, the Royal Asscher Cut has a high crown and 74 facets whereas the modern square-emerald cut, and the original Asscher both have 58 facets. The Asscher cut is beautiful paired with the halo setting or the solitaire setting. 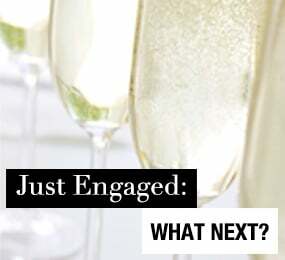 As you may have already guessed, the pear shape engagement rings gets its name from the fact that it is shaped like a pear. The pear shape engagement ring is cut using a modified brilliant-cut faceting, providing fire with a beautiful delicate shape. The weight of the elongated stone provides a sense of motion and direction to the design. Worn with the tapered end pointed toward the wearer, it has the added benefit of slenderizing the fingers and hands. 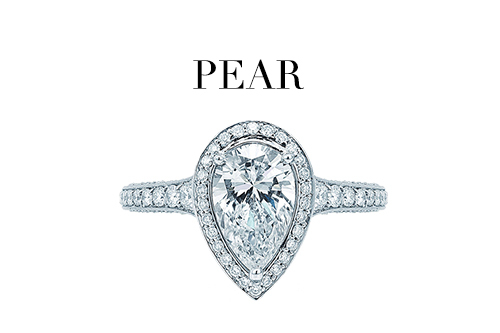 A pear shape engagement ring is the perfect choice for the bride with classic taste and an eye for creativity. 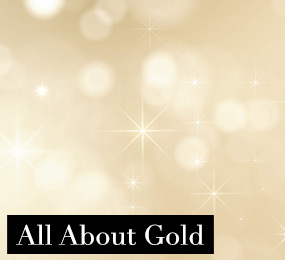 It is beautifully paired with a solitaire engagement ring setting. The pear shape engagement ring has elements of round and marquise cuts with one rounded end and one tapered one.